Remember back when everyone complained about the bright colors and rainbows appearing in the latest installment of Diablo? Blizzard does. Blizzard never forgets. You'll never forget it either, so don't click here unless you want one of the game's more entertaining secrets revealed. Blizzard made their opinion of the fan outrage over Diablo III's art direction perfectly clear back in 2008, when game boss Jay Wilson and the team sported the design above on t-shirts during the annual Blizzcon convention. Some of us though it was hilarious. Others were quite annoyed at the trolling. If you were in the latter group, now would be a good time to avert your eyes. Let me just take a moment to thank commenter generic_bad_guy for sending us the tip. I think that's enough padding. Welcome to Whimsyshire, where dreams come true. 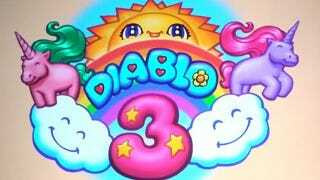 Through a convoluted series of actions, European Diablo forum poster Zerofire and friends opened a portal to a mystical land where rainbows, ponies, and soft, cuddly teddy bears roam free from persecution. Or at least they did. Now they are all dead. This colorful place is both a callback to the art controversy as well as a nod to the Secret Cow Level from Diablo II, itself a reaction to the rumors of a Secret Cow Level in Diablo the first. I would also like to point out that the author that wrote the My Little Pony / Diablo fan fiction from Monday might actually be a prophet. I must find this magical place.